As the film fraternity prepares for yet another edition of Indywood Film Carnival, the movie extravaganza, we now have Malaysia- based Orange County Sdn Bhd , signing up with Indywood for a healthy sponsorship of the Investors’ Meet. Through this unique sponsorship, Orange County, the Global New-Age Technology & Media Company is making its entry to Indian movie industry. The N-Face® Facial Motion Animation Technology, which is being considered as one of the finest technology, is able to Photo-Realistically bring back any Deceased Actor Live on screen. Further, the company has devised numerous workflows for production & VFX pipelines employing State of the Art Artificial Intelligence/Machine Learning technologies & the latest advents of engineering to credibly reduce the gestation involved in Producing Feature Films. Being a part of Indywood Film Carnival, Orange County would associate with various productions in the near future. Besides, this alliance would open up enormous opportunities in the Multimedia and Animation sector. The specialized team of multimedia experts can create market-specific creative multimedia training courses to cater the latest technologies to the exploding market. The Hollywood-grade advanced Visual Effects techniques will form the crux of these various courses being developed to enrich potential students to jump straight into professional Creative Multimedia Production ranging from Commercials to Feature Film content. The event would also witness the official launch of the Teaser from Orange County’s upcoming movie which is the Photo-Realistic Digital Re-creation of MGR in a full-length Feature Film. Orange County would also be honoured on the dias with an Award in the Best Innovation Category in Indywood Film Carnival. Orange County Sdn Bhd is a Global New- Age Technology & Media Company which has mustered the nuances of Film-Making from Concept till the rollout of Final Deliverables. The Company has embarked on a World’s 1st Showcase in Producing an International Feature Film earmarked for Global Release centered on the end to end Photo-Realistic Digital Re-creation of a Deceased Actor. The Company has created a leading- edge Solution in digitially creating & personalising the character attributes of any chosen Actor to take on a Photo-Realistic Digital Avatar in Motion Pictures. Thiruvananthapuram, 5 Oct 2018: As the wait comes to a close, Indywood’s second CSR movie “Aickarakkonathe Bhishaguaranmaar” hits the theatres today. The official launch Produced by UAE based Aries group using the corporate social responsibility (CSR) Fund, the entire revenue from the movie would be used for the relief and rehabilitation processed in flood hit Kerala. This 100% Charity Venture promises 25% of the net revenue will be used for upgradation and promotion of Film field and the remaining would be used for building homes for those who lost them in the worst ever floods that has hit the land of Kerala. The movie would be released in over 100 theatres today. The movie tells the tale of the life of the commons in a village named Aickarakkonam. Talented artists like Vipin Mangalassery, Samardh Ambujakshan, Sinseer Muhammad, Miyashree, Hridya Nijilesh, Lakshmi Atul, Shyam Kurup, Prabhiraj Natarajan, Mukesh M Nair and Basil Jose, chosen meticulously from the national level auditions conducted by Indywood Talent Hunt show, handle the lead roles and are well backed up by celebrated actors Lalu Alex, Shivaji Guruvayoor, Sunil Sukhada, Boban Samuel, Pashanamm Shaji (Saju Navodaya), Jafar Idukki, Kottayam Pradeep, Santhosh Keezhattoor, Seema G Nair and Manju Pathrose. Screenplay, Dialogue: K. Shibu Raj. Camera: P.C Lal. Editing: Johnson Iringol. Aickarakkonathe Bhishaguaranmaar will be dubbed into 10 languages including English, Hindi, Bengali, Bhojpuri, Tamil, Telugu and Kannada. It would be released in 15 countries including Australia, USA, UK, Malta, Austria, Hong Kong, Japan, Lebanon, Kenya, New Zealand, Singapore, Russia and Ireland on 12th October and in the GCC countries on 19th October. Aickarakkonathe Bhishaguaranmaar, which would witness the debut of 175 new faces, will create history by becoming the first Indian movie to be released in Lebanon. “It is our duty to help Kerala, which is going through its most devastating situation in a century, in every possible way. Aries Group is very happy and proud to be able to do such a service for the state. Both Aries Group and the cast and crew of Aickarakkonathe Bhishaguaranmaar were active in rescue and relief efforts during the floods in Kerala. They took up rescue efforts with the help of modern and lightweight rafts to get stranded residents to safety besides distributing relief materials including food, water and other necessary items. This is not the first time that we are offering a helping hand to the needy. We had been at the forefront of relief and rescue efforts following Nepal earthquake and Chennai floods in 2015. In Nepal, we could successfully built 200 homes besides relief and rescue works. In Chennai, we designated two teams of officials and staff for rescue and relief works. We have also donated the entire revenue from our first CSR movie to the homeless in Idukki and also distributed relief materials to the flood victims in Kuttanadu”, said Sohan Roy, Chairman and CEO of Aries Group. Kochi: Gone are the days where one has to go to a laboratory, wait in line to get the blood sample taken and then wait even more to know if he/she is suffering from dangerous diseases like HIV aids, Cholera and Rat fever. In what could be termed as one of the biggest healthcare announcements in history of Kerala, Dr Nawab Shafi Ul Mulk, Chairman of Mulk Healthcare Enterprises said they would soon launch a revolutionary initiative that will help the public diagnose dangerous diseases such as hepatitis, HIV aids, Malaria, Dengue, Rat fever or Cholera in just three minutes using their smartphones. Speaking at the press meet organized at the launch of Indywood Billionaires Club Kerala Chapter, Dr Mulk said that Mulk Healthcare Enterprises would launch the initiative from Kerala rather than Dubai as he is considered as Kerala is considering him as its son-in law. Mulk Healthcare Enterprises would soon launch a medical kit, which would make use of the Mulk App, which can be downloaded from goolgle play store. Then all one has to do is go to the nearest medical store and get the kit. Using a needle provided with the kit, the person should pierce his/her skin and upload the photo to the Mulk App and send it. In three minutes, the user will receive the result that is 99.99% accurate. “This will make diagnosis instant and cost effective, said Dr Mulk. Dr Mulk had earlier met Chief Minister Pinarayi Vijayan and Health Minister K K Shailaja teacher in this regard and both had offered support. Hyderabad (24-07-2018): Indywood Film Carnival, the much anticipated entertainment fiesta of the year, will be held at HITEX convention centre from December 1st to 5th 2018. The Carnival is expected to accelerate the growth of Indian Film Industry through materialising big budget movie projects, co-production ventures and B2B meet generating business worth Rs 500 crore. Sohan Roy, Founder Director of Project Indywood opined that Indian Film Industry should come forward to conceive and implement big budget international projects instead of following clichéd subjects and treatment pattern. “Our country is blessed with talented actors and technicians. However, our film industry is not concentrating on making movies which appeal to the international audience. Bahubali is an exception. The movie industry will fetch huge gains if we increase the number of international projects by using advanced technology and world-wide distribution. Indywood Film Carnival is an attempt to educate the stakeholders about the importance of such projects. The entire industry, including actors, technicians, producers and distributors apart from State/Union Governments should come forward to support this desi initiative,” he said. Hyderabad holds the Guinness World Record for the largest film production facility in the world. Moreover, Prasad’s IMAX in Hyderabad is one of the largest 3D IMAX screens and the most attended cinema screen in the world. And to top it off, Bahubali, the highest all time grossing movie sequel in India (combined gross collection of 376.2 million USD) was produced from the Pearl City. Project Indywood’s mission is to transform Hyderabad as the hub of Indian Film Industry. The Indywood Billionaires Club, launched last year with an aim to open the doors of Indian Film Industry for foreign direct investment, has already secured investments worth Rs 3,000 crore from around 20 leading NRI investors based in the UAE (United Arab Emirates), Europe and Asia-Pacific. IFC 2018 is expected to increase the investment by several folds. These in turn will increase job opportunities in related sectors apart from materialising mega movie projects. ALIIFF, one of the leading film festivals in the world, will host competitions in feature films, short-films, student’s short films, documentaries and debut directors. There will be a separate competition for Indian movies besides showcasing a wide range of productions including world premieres, animations, children’s films and travel diaries. Renowned film maker and script writer Balachandra Menon is the Festival Director of ALIIFF 2018. The Indywood Billionaires Club (IBC), has already mobilised funds worth Rs 3,000 crores from 20 leading NRI investors based in the United Arab Emirates, Europe and Asia-Pacific. Initiated by Sharjah-headquartered Aries Group, IBC aims to bring in crucial foreign direct investment to raise the profile of India’s cinema economy. USD 2 billion. Approx 12,000 crores! The economic value of India’s film industry. Add to it the allied sectors of entertainment, losses due to piracy and the umpteen opportunities to market and scale Indian films on a global scale. The potential is rightly, nothing short of a valuation 10 times the above said amount. The huge numbers are a clear indication of the possibilities India’s film and entertainment sector offers. One that needs dollops of cash infusion, as well as strategic partners who can shore up its pre-production, production, distribution and film exhibition on par with international standards. The Indywood Billionaires Club, an innovative initiative launched during the 3rd edition of the prestigious Indywood Film Carnival in 2017, has set the wheels rolling to this regard. By already raising investments of over Rs. 3,000 crores from nearly 20 Indian Billionaires based out of United Arab Emirates, Europe and Asia-Pacific, IBC’s end game is to secure investments to the tune of $10 billion from 2,000 billionaire Non-resident Indians and companies over a period of few years and direct the investment to the multi-billion dollar cinema economy. NRI businessman Sohan Roy, who is consistently featured in Forbes Middle East’s list of Top 50 business owners, is the brainchild behind IBC. A serial entrepreneur and Hollywood filmmaker of Indian origin, his company Aries Group is the chief executing agency of IBC’s ambitious plan. “India is blessed with talented actors and technicians and our film industry should make movies which appeal to the international audience. The movie industry will fetch huge gains if we increase the number of international projects by using advanced technology and world-wide distribution”, said Mr. Roy. Of the $10 billion to be raised as investment $5 billion will be spent on theatres, $2 billion on studios, $1 billion on movie production, $1 billion on equipment manufacturing and $1 billion on talent schools/agencies. Project Indywood, of which IBC is part, has already lined up plans to put up 10,000 4K projection multiplex screens, 100,000 2K/4K projection home cinemas, 8K/4K film studios, 100 animation/VFX studios and film schools adhering to international standards across the country. According to a report prepared by Deloitte for Indywood, the Indian entertainment industry is expected to grow at 11 per cent CAGR reaching $3.7 billion by 2020. Understandably in the coming years, the volume of foreign direct investment will play a decisive role in conceiving and implementing mega projects. And this is where the IBC comes in. Set to include over 100 Indian billionaires into its fold by the end of this year, the Indywood Billionaires Club will also educate prospective investors on effectively tapping opportunities in the growing Indian film and entertainment sector comprising movies, animation and graphics. Mr. Roy further added that the Indian film industry should come forward to conceive and implement big budget international projects instead of following clichéd subjects and treatment patterns. The Indywood Film Carnival (IFC) is being seen as the one stop confluence to bring together the industry’s present and future stakeholders. The annual event will be having its 4th edition in Hitex Hyderabad between December 1 and 5, and is expecting the presence of 5,000 business delegates from across 100 countries. Business to the tune of Rs 500 crores is expected to be generated by way of signing up of big budget movie projects, co-production ventures and B2B agreements. Indywood Billionaires Meet, Indywood Academy Awards, Indywood Telly Awards, Indywood Fashion Premier and All Lights India International Film Festival are the major attractions of IFC 2018. Please visit the following links to know more about Indywood Film Carnival. Hyderabad (28-07-2018):Ushering in a new era for Indian cinema awards, the prestigious Project Indywood, a 10 billion USD initiative that aims to elevate Indian cinema to an international level,is initiating Indywood Academy Awards (IAA) at HITEX, Hyderabad on December 1st. The Indywood Academy Awards, an integral part of Indywood Film Carnival 2018, is the first of its kind to move away from the traditional selection processes. Instead, it will rely on a multi-stage selection process that involves 1000+ members of the World Film Society and a 10 member Executive Jury Panel chaired by renowned Bengali filmmaker, music director and cinematographer Goutam Ghose. The initial entries will be open to all and the contention list will be prepared internally.Following this, the short list nominations will be prepared based on recommendations given by members of the World Film Society. The Executive Jury Panel will take the final decision and declare the winners on December 1st. Indywood Academy Awards aims to promote excellence in different categories of filmmaking, raise global attention for films that are not inherently commercial, and encourage production of quality films on a global stage. The 10 member Executive Jury Panel will be headed by renowned Bengali filmmaker, music director and cinematographer Goutam Ghose. The other members are:Ashish Kulkarni (pioneering animator), B Lenin (National Award winning film director, editor and screenwriter), Madhu Ambat (National Awarding winning cinematographer), Rangan Baradwaj (National Award winning film critic and writer), Ravi Varman Leading cinematographer), Shajith Koyeri (Leading sound designer), Viveck Vaswani (Leading actor, writer and producer), Vivek Agnihotri (Leading director, producer and screenwriter) and Mayur Puri (screenwriter, lyricist, actor and film-maker). The World Film Society, a forum designed and developed for uniting film sectors across the world for the betterment of the global movie industry, will play a crucial role in preparing the nomination short list. Initiated as part of Project Indywood, World Film Society aims to support the movie industry by creating a close-knit relationship between motion picture associations and their related departments. Conceived by Founder Director Sohan Roy, Project Indywood is a 10 billion USD initiative to elevate Indian cinema to an international level. Through Project Indywood, the NRI investor turnedHollywood director aims to establish 10,000 4K projection multiplex screens, 100,000 2K/4K projection home cinemas, 8K/4K film studios, 100 animation/VFX studios and film schools adhering to international standards. Indywood Film Carnival, a flagship venture of Project Indywood, has been a platform to meet, connect and showcase the best of India’s numerous film industries with national and international stakeholders of cinema. It is the one stop shop for the entire spectrum of film creation including film makers, production houses, technology providers and aspiring artists to converge and make the dream of a unified Indian film industry a reality. Continuing the success streak of its predecessors but bigger and better than ever, Indywood Film Carnival 2018 will return for its fourth edition from December 1st to 5th, 2018. The event comprises of the All Lights India International Film Festival (ALIIFF), Indywood Film Market, Indywood Talent Hunt, Billionaires Meet and an array of Excellence Awards. The Carnival is expected to accelerate the growth of Indian Film Industry through materialising big budget movie projects, co-production ventures and B2B meet generating business worth Rs 500 crore. Indian films have been a regular affair in major international festivals. And now, achieving the Oscar dream seems plausible too. Lobbying, promotions, and what not! The race to the Oscars is a mad rush. Indian cinema, despite its rich storytelling tradition, has not been able to decode the Oscar secret. Until now that is! The All Lights Film Services, which broke into this niche scene 2 years ago, is leading the Indian charge, helping filmmakers attain international recognition at the Oscars. In a freewheeling chat with Indulge Magazine, Nisha Joseph, Manager of the All Lights Film Services, explains the Oscar process, the hurdles faced by filmmakers and how the organization she represents has made the dream possible for over 10 films from the sub continent in less than 2 years. First of all, can you explain what all categories are open to foreign filmmakers and the process for a film to be selected into the Oscar contention race? Under the foreign film category of Oscar, “Best Foreign Language Film” is the only category for the foreign filmmakers. The entry to this category is just one per country and is recommended by the film federation/film apex body of the country. But under the mainstream category of Oscar, any filmmaker can send their entries. There are around 26 category competitions under this including Best Picture, Best Director, Best Actor, Best Actress and so on. For the contention, the movie should primarily go through a series of qualification criteria including Los Angeles Screening for 7 consecutive days and if it is not in English language, it should have English subtitles. How difficult is it for an Indian movie to compete with other foreign films? The key is to get noticed. According to a recent report, an Oscar campaign is said to cost approx $3 million to $10 million which includes mass PR campaign and publicity generation through adverts, holding lobbying parties at LA, New York and the film’s parent country, sending out screeners to Oscar jury members, special review reports / critic reviews in famous film journals and publications etc. While Hollywood movies are funded by big studios who undertake the above mentioned tasks for their respective movies publicity campaign for them, for an Indian movie to cough up such a large amount is extremely difficult. Since the start of operations, how has your organization helped Indian films gain international recognition? We have helped 12 Indian Films so far which have all vied for contention under the mainstream category. We have a full fledged team and industry affiliations to screen the movies in LA and carry out other necessary documentation. Some of these movies include Ballad of Rustom, Kamasutra 3D, Pulimurugan, DAM 999 and Color of Sky. Apart from that, we have recently helped send a Sri Lankan movie for contention, which is a first for the island nation. Besides conducting rigorous campaigns to help movies get into the very prestigious ‘Oscar Race’, we also help Indian filmmakers to take their movies to film festivals, film markets and film awards around this world. Thus we make sure that such movies don’t go unnoticed at any film circuits. We have also launched movie sales, an initiative by the All Lights Film Services, where we help film makers to sell their movie rights in a more customized format, and ensure that they receive a comparatively higher amount. What are some of the upcoming projects which your organization is lobbying for? We are currently working on three films, which include a dance documentary (short) titled ‘The Serpent Wisdom’ from India, a feature film titled ‘The Frozen Fire’ from Sri Lanka and a Malayalam feature film titled ‘Aikarakkonathe Bhishaguaranmar’ (Doctors of Aickarakkonam). All these projects are unique, both in content and production. How can a filmmaker approach you? Filmmakers usually approach us directly, or by participating as delegates or submitting their works for the All Lights India International Film Festival, which we conduct annually at Hyderabad. We forge partnerships with movies screened here that we find special. This year, the 4 day film festival will be held at PVR Inorbit Mall. Interested filmmakers who wish to vie for Oscars can mail us at contact@alfilmservices.com or call us on 9539 000 509. Aries Group Launched Advanced Technology of Visual Asset Management Concept to Indian Maritime & Naval Market @ DIMS-2018, An International seminar on developments in Offshore, Shipbuilding, Transport and Allied Sectors, held on 3rd and 4th of August 2018, at Crowne Plaza, Kochi, Kerala, India. Kochi,Kerala ,India August 4, 2018 – Aries Group’sIDEAS division catering to “Intelligent Engineeringsolutions’ Launched the Visual Asset Management Solutions concept in India during the first edition of DIMS-2018, An International seminar on developments in Offshore, Shipbuilding, Transport and Allied Sectors, held on 3rd and 4th of August 2018, at Crowne Plaza, Kochi, Kerala, India. Aries paper presented during the Seminar introduced the concept of 3D laser scanning Techniques and 3D Photogrammetry for capturing ‘As fitted’ information in Naval Vessel and Submarines. Lt Cdr Naveen Nair (Retd) ,Technical Manager of Aries Marine who presented the paper explained about the Intelligent techniques that are used to collect and post process the asset information.He demonstrated how the concept of 3D photogrammetry is applied for creating a ‘true’ 3D environment of the complex asset that shall assist in the management of its information using a simple and visual interface. The advantages in the application of 3D techniques for retrofit of new equipment/weapon systems in an existing operational asset waspresented. The paper covered the use of these advanced techniques for execution of “Alteration and Additions” in any Sea and shore assets. A case study showing the utility and benefits of these techniques was presented to expert who attended Maritime Seminar. Aries Group CEO Mr.Sohan Roy who attended the event commented that “With a track record of close to 44,000 projects completed for 4750 Clients for activities inEngineering,Inspections,Maintenance &retrofit projects, Aries Marine is now one of the world’s leading Inspection,Engineeting and Asset Integrity Solution provider for digitization and intelligent techniques of existing assets. The company is now focusing to be the one-stop shop for suchAsset Integrity Management/Monitoring tasks providing services ranging from engineering, project management. Inspections, Document Management and Software integrated solutions with our Infotainment concept model”. With 47 entities and presence in 15 countries GloballyIndiaincluding India, AriesGroup have various advanced technologies introduced focusing on current marked demand and digitization based on Big Data analysis. Established in 1998 by Mr.Sohan Roy, Aries Group is now one of the world’s largest Asset Management Solution provider with consultancy,Inspections,Maintenance and survey in all maritime, oil& gas, Offshore hubs and more than 1600 employeeson its rolls. The two day seminar DIMS -2018 organized by the Department of Ship Technology Alumni Society(DOSTAS) was inaugurated by Dr.MaliniShankar.IAS,DirectorGeneral of Shipping and was presided by Mr.Madhu S Nair .CMD, Cochin Shipyard, India. Aries presentation made during DIMS-2018 which was among the shortlisted 16 technical papers focusing on latest innovations in maritime sector attracted the gathering of professional delegates form the industry representing various stakeholders in Maritime, offshore & Defense industry. Kochi(23-07-2018):: In a move that’s expected to usher in an era of standardization to the Indian film industry, Kochi-based Pattanam Designory, one of the leading make up institutes in Malayalam film industry, has received the prestigious Indywood accreditation for its popular courses and adherence to quality standards. Anson IJ, COO, Indywood Talent Hunt handed over the certificate to Pattanam Rasheed at a function held at city on Wednesday. Run under the supervision of noted make-up man Pattanam Rasheed, Pattanam Designory is an approved centre of CTTC (Centre for Trade Testing and Certification of skilled workers) under the Union Ministry of Labour and Employment. The institute is also on the verge of becoming the first in the field of media make-up to be affiliated with the Calicut University. The courses at Pattanam Designory emphasize on the skills required for professional motion picture make-up. Students also get to learn facial contouring using highlights and shadows, correction and concealing techniques, base matching, eye and lip treatments and air brush techniques. The Indywood Accreditation is bestowed by the Indywood Entertainment Consortium and is availed upon a multi-pronged examination of the Quality, Merit, Experience, Reputation, Reference, Insurance, Interest and Legal Existence of system/product/ organization. Indywood Accreditation is valid for all national and international clients / organizations in the field of media, films and entertainment. The Accreditation is one of the set targets of the USD 10 billion Project Indywood which aims to unite all Indian regional film industries under one umbrella. The annual Indywood Talent Hunt is a confluence of creative talents from India’s student community to be held at Hitex Exhibition Center in Hyderabad. Over 5000 finalists participate are expected to participate this year in 28 different creative Categories including Model Hunt, Short Film Making, CSR Video Making, Documentary Film Making, Music Video, Music Production, Educational Video, Photography, Animation, VJ hunt, RJ hunt, DJ war, Music Band, Performance art, Best Reporter/Journalist, Poster design, Indywood vision video etc. This year will see one of the biggest fashion pageants in India known as Model Hunt being conducted during the 4 day extravaganza. Model Hunt aims to bring together the best Models from around the country and showcase them in front of the global film fraternity. Indywood Film Carnival has been a platform to meet, connect and showcase the best of India’s numerous film industries with national and international stakeholders of cinema. It is where film makers, production houses, technology providers and aspiring artists converge to make the dream of a unified Indian film industry a reality. Prabhiraj played a crucial role in the evolution of UAE-based Aries Group as a global conglomerate. 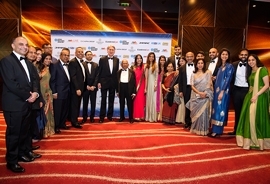 Singapore-based Pravasi Express honours prominent NRIs for their professional excellence and contributions to society. Kochi (18-07-2018): PrabhirajNadarajan, a leading NRI entrepreneur and Managing Director of Aries Group of Companies, has been honoured with Singapore Pravasi Express Business Excellence Award for his exceptional leadership qualities and business acumen. The award was distributed by Singapore Senior Ambassador Gopinath Pillai at a function held at Kallang Theatre in Singapore. Lee Hong Chuang BBM, Advisor, HougangGrassroot Organization, Singapore, was also present on the occasion. UAE headquartered Aries Group is a multinational consortium of 47 companies having presence in 15 countries. As a part of Corporate Social Responsibility (CSR) and women empowerment activities, he recently established an office at his home town in Punalur in Kollam district. The office employs 85 staff, most of which are women. He also has been distributing pension and welfare schemes for 30 parents in his village. Hyderabad (03-07-2018): In an effort to create awareness about the importance of CSR (Corporate Social Responsibility) activities, Indywood Talent Club, a worldwide network of student clubs aimed at promoting art and culture and managed by Indywood Talent Hunt, has invited entries for international-level video contest based on CSR related themes. US dollar Project Indywood. ITH is a premier national-level platform to discover creative talents in various artistic and cultural domains. Sri Lanka (04-07-2018): For the first time in the history of Sri Lankan film industry, a movie from the Pearl of the Indian Ocean, shall vie for Oscars 2019. The movie titled ‘The Frozen Fire’, directed by Anuruddha Jayasinghe, is the first Sri Lankan movie to enter in mainstream ‘Best Picture’ category of Oscars 2019, the officials revealed. The ultra modern SUV which offers luxury, dynamism and power will cost 3.25 US dollars. Dubai (11-06-2018): Good news from the multi-million dollar luxury car industry for all Indians to cheer and cherish. UAE-based NRI entrepreneur Sohan Roy, who is the Chairman and CEO of Aries Group, is the first Indian in the world to buy Rolls Royce’s latest edition – Cullinan, an ultra-luxury SUV, the first-of-its-kind manufactured by the legendary British car brand. The ultra modern SUV which offers luxury, dynamism and power will cost 3.25 US dollars. He is buying Rolls Royce Cullinan, the most premium luxury SUV, as a wedding anniversary gift for his wife. Abhini Sohan is the Managing Director of UAE-headquartered Aries Interiors. She is currently co-producing the world’s second CSR movie titled ‘Aickkarakonathe Bhishaguaranmaar. Sohan Roy is a naval architect by profession and a film maker by passion. He is also the Founder Director of Indywood, a 10 billion US dollar initiative that aims to catapult the Indian movie industry into a global phenomenon in the next five years. Aries Group, established in 1998, is one of the largest multinational conglomerates in the Middle East today. The group currently operates 47 companies in 15 countries across the globe. It has made its presence felt in areas such as oil and gas, marine, media, medical, entertainment and tourism. Named after the largest gem-quality rough diamond ever discovered, Cullinan sits between the Ghost and the Phanthom in Rolls Royce’s line up. Unveiled in May 2018, the heart of the SUV is a twin-turbocharged 6.75-litre V12 engine producing 563 hp of power at 5,000 rpm and 850 nm of torque at 1,600 rpm. The engine is mated to an eight-speed automatic transmission providing a top speed of 250 km/h. Standing at 1,835 mm tall, 5,341 mm long, 2,164 mm wide and weighing in at 2,660 kilograms, Cullinan is a giant of an SUV. The Cullinan uses a permanent all-wheel drive system, first for a Rolls Royce. With multiple driving modes, dedicated off-road mode, 4-wheel steering and a selectable iDrive dial, the SUV does not have trouble wading through water as deep as 54 centimeters. Kollam: (22-05-2018): The shooting of ‘Aickkarakonathe Bhishaguaranmaar’, produced by UAE-based Aries Group utilizing its Corporate Social Responsibility (CSR) fund has started. Leading NRI industrialist turned Hollywood director Sohan Roy spearheads Aries Group. Dubai (14-05-2018): UAE-based NRI industrialist Sohan Roy (http://sohanroy.com), Chairman and CEO of Aries Group has been featured in the coveted ‘Top 100 Indian Business Owners in the Arab World 2018’ list released by the Forbes Middle East. This is for the fourth consecutive year he has been featured in the top 50 count on the list. Under the astute vision and leadership of Sohan Roy, a naval architect turned Hollywood director, UAE-based Aries Group has grown exponentially. Aries Group (http://www.ariesgroupglobal.com), today, is one of the largest multinational conglomerates in the Middle East with 47 companies operating in 15 countries across the globe. The diversified group has presence in oil and gas, marine, media, medical, entertainment and tourism sectors. Sohan Roy who is the Founder Director of Indywood (www.indywood.co.in) also spearheads Indywood consortium which is backed by 2,000 Indian billionaires and corporate. Sohan Roy’s Hollywood directorial venture Dam999 movie had won many national and international accolades. Besides he pioneered the concept of building dual 4K multiplexes and Atmos home cinemas in less space. Dubai (26:04:2018): The UAE-based Aries Group’s Indywood Consortium has initiated USD 10 billion investment in India and Middle East as part of Vision 2020 said Aries Group Chairman and CEO Sohan Roy. He announced investment while addressing the media persons here on Sunday. “We will increase our market share in marine, tourism and entertainment sector by 2020. In entertainment, we will set up top notch multiplex screens, home cinemas, animation/films schools in India and Middle East. We will invest USD 10 billion in the next five years and it would generate 1,00,000 job opportunities. The details of other ventures will be announced soon,” said Sohan Roy. In addition to this, the group will produce international movies using advanced technology and worldwide distribution. “We will promote young talents through movies and it would be a golden opportunity for them to showcase their talents,” said Roy who is also a Hollywood Director. The consortium plans to produce 1000 movies over the next 5 years, with added focus on the Indian animation and television industry. Integrated dubbing centres and film schools are also part of the process to ensure the readiness of highly skilled talent when it’s time to shoulder the impending cinematic revolution. Through all this, the consortium aims to ensure efficient monetization of Indian cinema’s potential and raise its share in global cinema to 40%. Work has also begun on multi-format cinematic infotainment programmes such as educational content and sporting events that will redefine the theatre sector and make it an avenue of visual entertainment 24×7. Further, several mega film and theatre projects have already been announced by future members of the consortium including India’s most expensive movie- the Rs. 1000 crore Mahabharata, and the world’s 1st 8K multiplex project at Udupi. Work on other similar multiplex projects in India has also been started. The consortium further aims to add 1000 8K Screens in India by 2020, with the capacity to make, screen and show this high end format across the country and abroad. The zeal of the consortium has been recognized by cinema powerhouses such as South Korea, Nigeria, Iceland, Czech Republic and even non-cinema nations such as Saudi Arabia, who have acknowledged the value of film tourism and a global cinematic movement led by Indywood. The consortium hopes to inspire more investors to invest in the country’s cinema industry and manufacture indigenous products for the local industry. To mark the 20th anniversary celebrations, Aries Group has chalked out various CSR and Sustainable energy campaigns. “We will organise awareness campaigns and seminars in association with various corporate, NRI associations, self-help groups etc to promote the importance of CSR and sustainable energy,” said Satheesh Chandran, Director of Aries Group. Aries follows integrated management system (IMS) certified by ISO 9001:2008, 29001,14001 and OHSAS 18001 and constantly strives to meet HSE requirements and equipment condition monitoring to lessen the likelihood of failure. Aries Group’s management policies on job security, retirement plans & parental welfare ensures higher staff commitment and ultimately complete customer satisfaction. ‘Corporate Social Responsibility’ is a vital part of any business organization, and Aries Group of Companies strongly believes in serving the society in which it thrives. Through years the company has been serving its society through its various CSR activities including Green initiatives, Charity Activities and encouraging young talents through scholarships to further their studies. Produced the world’s first Charity movie – Jalam. A charity movie is entirely a new concept in film production. Contribute a brick is the motto of this film. The complete profit from the film was used for the rehabilitation of the landless people and to support women empowerment programs. Aries Group to share 50% of its profit with the employees to make them more responsible and committed. Aries Marine, the flagship company of Aries Group and the largest Ship Design and Consultancy firm in the Middle East, was established on 28 March 1998.